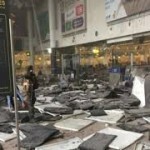 The Belgian government has confirmed there are casualties but has given no numbers yet. The cause of the explosions is unknown. The airport is being evacuated and has been closed to flights. The blasts come four days after the capture in Brussels of Salah Abdeslam, the main suspect in the jihadist attacks in Paris on 13 November 2015. Emergency services are clearing the airport completely. Belgium’s Het Laatste Nieuws reports that more bombs have been found. The Belga news agency reports that shots were fired and shouts in Arabic were heard before the two explosions. Images on social media showed smoke rising from one of the buildings, amid reports of panic as people fled the airport. Rail transport to the facility has been halted and people have been told not to come to the airport. Other reports say at least one of the explosions was close to the American Airlines check-in area but this has not been confirmed. 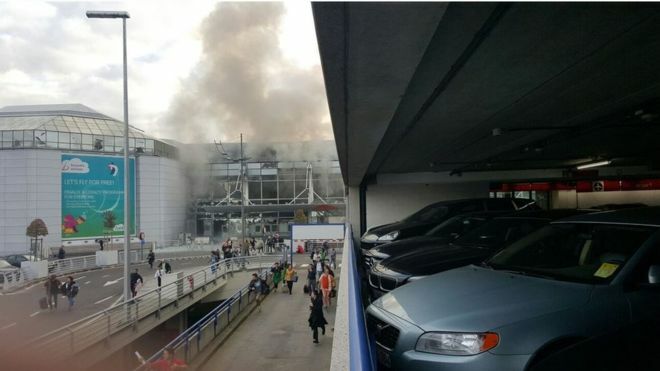 Niels Caignau, a Swissport employee, told Flemish broadcaster VRT: “I was on a break and heard and felt a big explosion – we have from here a view over the departure hall and saw a plume of smoke come out. 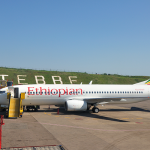 The Zaventem airport is 11km (7 miles) north-east of Brussels and dealt with more than 23 million passengers last year.